If check is the look you're going for, our Charn suit may just be the one for you. Lined in blue, with blue and platinum geometric patterns and a bronze pocket trim, this suit is best worn with brown shoes to bring out the highlight brown and blue Heritage buttons on the jacket and waistcoat. Charn is available to hire at €175 including a tie and new shirt. 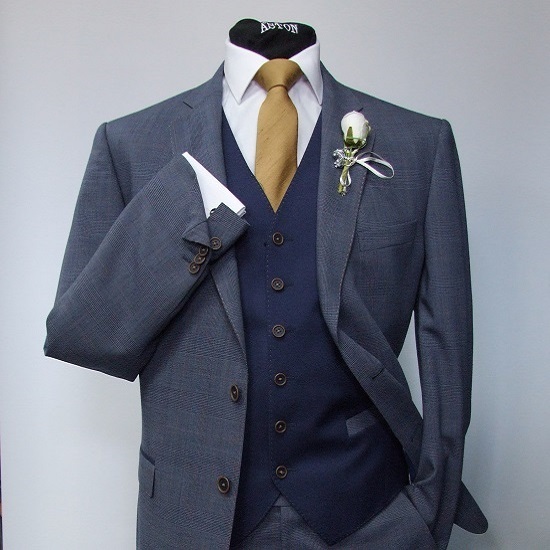 This suit is also available made to order to your own tailored sizes especially for your wedding day. For the groomsmen, we recommend our Carter suit.